Nowadays, to find a phone charging station is like to find an oasis in the desert. 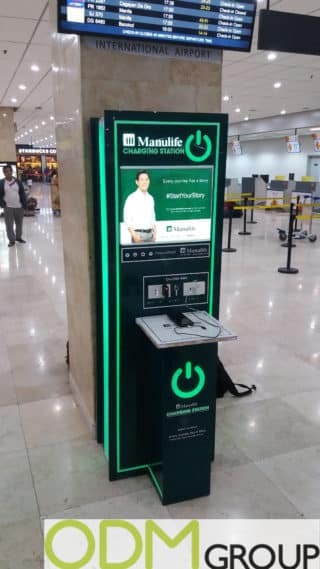 But there is no doubt being based in an International Airport, Manulife ‘s charging station gets a lot of visitors a day. Manulife Financial is a Canadian insurance company and financial services provider that thought about a tech marketing campaign. We can see here below one of its green custom charging stations. The station is presented as a basic led display with an additional platform where you can place your phone while charging. The superior part is entirely dedicate to the brand and to advertise, while in the middle are located some sockets. This advertising idea is both, striking thanks to the led lights contrasting the dark case, and also extremely useful to people that need to charge their smartphone. Why is this custom charging station an effective advertising agent? Branding: This is a huge advertising display. More than enough space for branding, advertising or both. The display can then be customized in the shape, colour, structure… and it will also be highly visible due to dimensions and light play. Practicability: It is a charging station and it is studied purposely to be practical for people to charge their phone or tablets in case of necessity. However we would suggest a more convenient solution such as integrated cables for iPhone and other brands. People may not have their cable with them or they have one not fitting the socket. Advertising: As we said, this display is fully advertising area. You may introduce your brand, promote a product, launch a competition… and people waiting for their battery to be restored, will stand there looking around and at your charging station display.